Bingo at the Cavalier Hall at 855 Lisbon St. in Lewiston behind Staples is run by Loaves & Fishes. 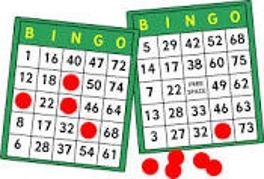 We will be playing on Sunday(Super Bingo) afternoons and Monday and Friday nights. On Monday and Friday, doors open at 3pm and bingo starts at 6:30pm. For our Super Sunday Bingo, doors open at 10am and bingo starts at 1pm. On Monday and Friday, bingo is $10 for up to 48 cards. On Sunday, bingo is from 12 cards for $20 to 48 cards for $50. Come have fun with us and support a worthy cause. If you need directions to our location, call us at 784-0244. See you all there!! Loaves & Fishes' garage sales have moved to 759 Middle Road in Sabattus. We are now open Wednesday and Thursday from 9 am- 1 pm and Friday and Saturday from 9 am-3 pm. Donation pick ups will now only take place on Mondays. If someone has questions or would like to donate items, they can call Loaves and Fishes at 740-0244. We accept empty bottles and cans all year round. You may take your bottles/cans to MT Bottle Redemption Center at 1360 Sabattus St. and tell them to credit the Loaves & Fishes account or drop them off at the convent. Once a month, each member will be placed into a drawing to win $1,000. We only accept 300 people, but we are always looking to fill vacant spots and put names on our waitlist. If you are interested in becoming a member, please call Donna at 207-615-7222. For more information on fundraisers, please call 375-8399. Bingo! Fridays at 6:30 p.m., Sundays at 1 p.m., and Mondays at 6:30 p.m. Please help us show appreciation to our sponsors by clicking on their ads to visit their sites.